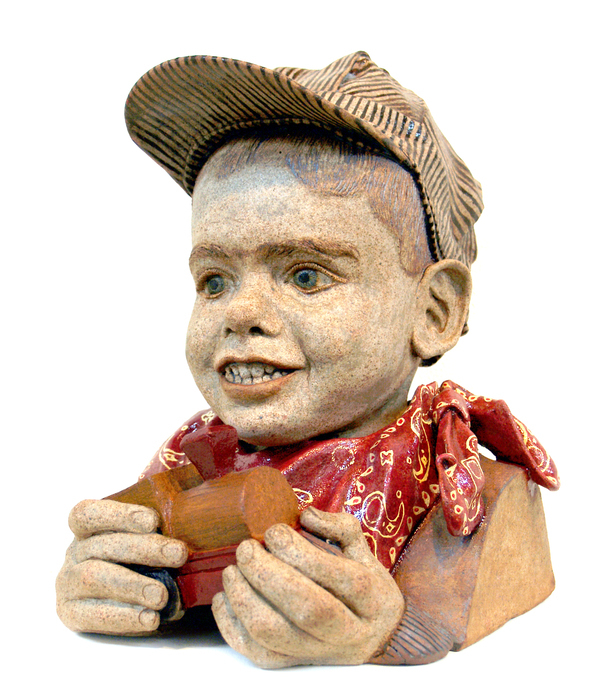 I was born in Chicago on September 24, 1948, to Olaf and Marguerite Ellison and raised in Downers Grove, Illinois. At the age of 41/2, I contracted Encephalitis Lethargica, Sleeping Sickness, along with over 50 other children and adults. We were bitten by Tsetse flies, which hatched from the larva contained in fruit brought from Africa by a missionary. About a dozen of us survived and only a few were left functional. My fever rose to 108o and I was in a coma for 6 weeks. My brain was wiped clean. The doctors gave my parents little hope, saying I would be severely retarded. My parents refused to accept this diagnosis and prayed for my full recovery. When I came home from the hospital my mother began retraining as a newborn infant. I entered kindergarten 6 months late. Among my learning disabilities are Dyslexia which actually made me good at art, a poor short-term memory compensated for by a phenomenal long term memory and Narcolepsy with the flip side of a high energy level. The school district’s solution was to put me in “special school”. My mother would not hear of this because she was determined all three of her children would go to college. To the consternation of all but a few of my teachers she demanded full inclusion for me. Throughout public school I had to work twice as hard as my peers to learn the same things. My mother taught me two important things; a disability is not an excuse but a reason to try harder and I was spared for a purpose, which God would reveal. The brain damage had been mostly to my left side, which was a blessing because it left me very artistic. In first grade the teacher assigned a classroom mural on butcher paper about summer vacations. I saw a post card of the Statue of Liberty she had on her wall and asked if I could draw it. The teacher, amazed by my drawing, kept after my parents to take me to The School of the Art Institute of Chicago for Saturday art lessons. My parents could not afford it. So my mother would take me to The Museum of the Art Institute of Chicago as often as she could and found a local private art teacher for me. We lived near a 100 acre woods and my earliest artwork was of nature. Then two incidents convinced me I wanted to be a professional artist: The first was a visit to the Art Institute when my mother had me walk through a narrow door. To the right was a maze of dots. I asked my mother, "What is this mess?" She told me to turn my back on it, walk to the other side of the room and turn around. There before me, in its entire splendor, was Seurat's A Sunday on La Grande Jatte. I wanted to use color like him to make something appear out of nothing. The second event occurred when my Aunt Helen took me to her church where Warner Sallman was demonstrating and talking about art and faith. I saw him create the pastel painting of The Good Shepherd. I, too, wanted to inspire people with my art. I received my B.F.A. from Eastern Michigan University, was married to my childhood sweetheart Marci Schattenberg, a polio survivor, and went on for my M.A. & M.F.A. degrees at Northern Illinois University. At that time I was an abstract expressionist with a fantasy/Surrealistic twist, but the painting program there wanted me to be a Hard Edge painter, so I transferred to the ceramics program. There I became a glaze chemist doing my paintings in glaze effects on the fantastic forms I created. When I came back to painting years later, this was of great benefit because I understood volume and depth in a way that most painters cannot. Afterwards I served as a Captain in the Army, then as the Director of the Beverly Art Center, School of the Arts. During this time my two children Jennifer and Peter were born. 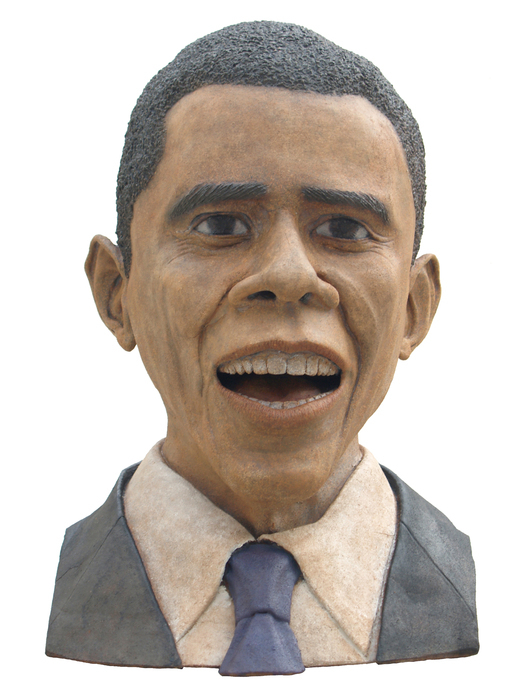 Later I was a ceramics teacher at South Holland Community College in Illinois. While struggling to be a professional artist and teacher, I received a prophetic call from God and headed to the seminary with my wife and two children. I wrongly gave up art, thinking that God wanted me to deny this part of myself. I received my Master of Divinity and pursued the ministry for twelve years until it was revealed to me that the ministry was a preparation for my call to reach people through my art. 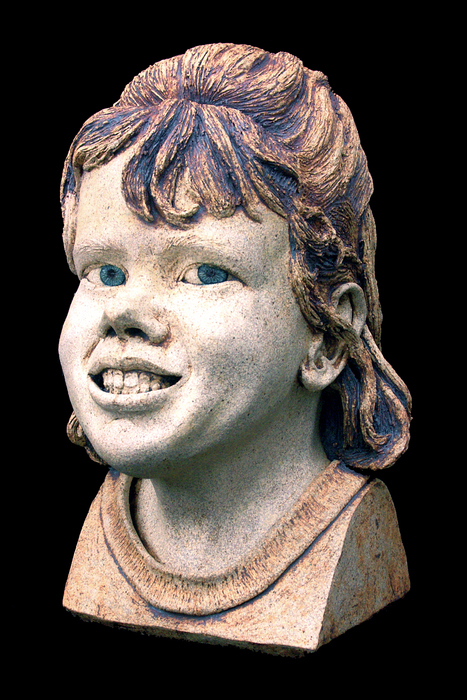 So I re-entered the art world with God at my side as a Symbolic-Realist painter, sculptor and potter. I have shown my art in national and international shows, winning many awards. My work has appeared in the Manhattan Arts International Magazine and the Encyclopedia of Living Artists. I have received two honorary titles: Professor of Art, Academical Associated del Verbano; Accadamia Internazionale “Greci-Marino”, Acadamia del Verbano Italia, di Lettere, Arti, Scienze and Academic Honorem of Santarita, Order of Arts Michelangelo Buonarroti from the International Academy Santarita, Turin, Italy. Eleven of my paintings have been published as signed and numbered limited editions. I have copyrighted and published The Perceptual Color Corona, a revolutionary color system, based on the negative afterimage to get better color matches, vibrating color contrasts, and luminescent color harmonies. I have created a method of artistic interpretation and communication by combining my divinity work with cultural anthropology and Jungian psychology through the use of color, line and shape. During this time I taught art at Nogales High School in La Puente California. Having retired form teaching, I have become a full time artist painting, sculpting and creating pottery. 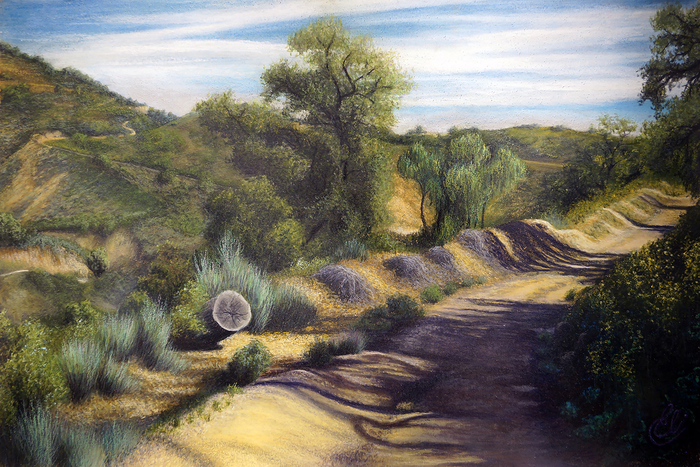 I like to hike and paint on location and became a docent for the Puente Hills Habitat Authority leading art hikes into the wilderness. 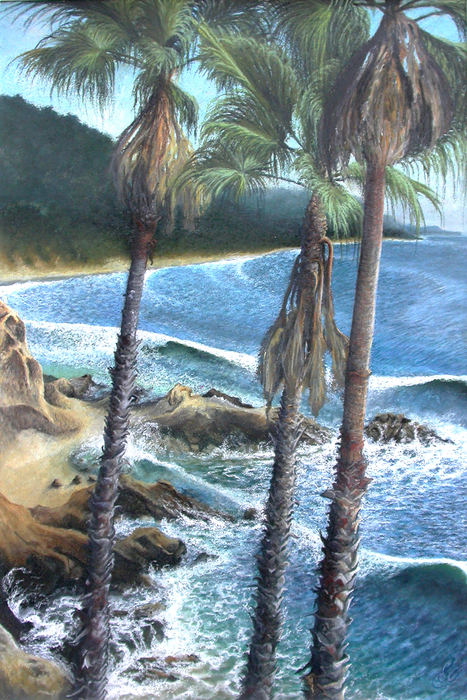 My artwork can be seen in the co-op Gallery SOHO of the Pomona Valley Art Association in Montclair Plaza Montclair, CA. Also my artwork is on line at http://ellisonjamesb.com. To do this I bring to my work a unique blend of aesthetics, theology, psychology and creativity. I believe that we are all created in the image of God and thus we are by nature creative beings. When God breathed the Spirit into the first human, God breathed it into each of us. As an artist, I communicate this divine presence in the world by which people can grasp the great and sublime. As I create the image I begin with evolves into something far as each element works towards the single inspired whole I pursue with all my skill, insight, and knowledge to communicate the essence of what lies within my vision. To find my subject matter I hike in the Mountains and foothills or along the ocean shore looking for scenes that speak to me. Once I find one I hike back with my Backpack French Easel. 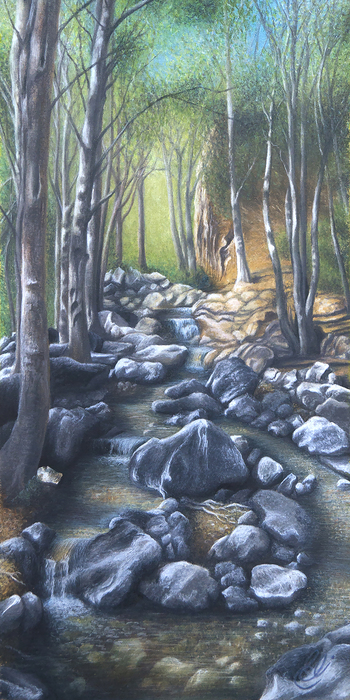 If I am working in pastel I will hike back 6-8 times more as well as take photos to finish it. If I am working in oil I sketch and begin my painting as well as take photos to work from in my studio, as it will often take me 2 to 3 months to finish. It takes this long because my work is very detailed. I am a Symbolic-Realist. This is different than traditional symbolism, which is tied to specific objects and can only be understood in the context of that specific culture or time. Symbolism that is based on the psychology of color, line, shape & page placement is free of such limitations because it is based on our common humanity. Thus I do not reproduce as a p camera would because I subtly changed things either buy moving my easel to left, right, up or down to catch different angles and by actually moving an object in the image to communicate a specific message about life. Using this approach I can communicate meaning to anyone on a subconscious level. When a person views my artwork and it appeals to them, they understand the message I have put inside though they may not be able to verbalize it. Thus I write artistic statements to bring it to conscious level. What has happened at shows where I have not displayed the statements is that people buy a print or original on impulse and later read the statement often returning to tell me how did I know this was what they were feeling or experiencing in life. The images I create are considered super-realistic because what I strive to do is create a painting that is better than a photo, so real you feel you could walk in to it. Everyone has experienced where a photo of a favorite scene falls short when compared to what they saw. First reason this happens is because a camera is monocular and cannot reproduce volume and depth. Our brains interpret volume and depth in photographs because of overlapping and size reduction. They lack reality because of their flatness. Because I either paint on location and/or do a photo survey taking pictures in a 180 arc I can reproduce the effects three dimensionality that we see because of our stereo vision. In addition by taking photos at various times of the day I am able to catch the effect of the shifting lights and shadows. The second reason a camera does not capture what we see is it can not see color in reflected light and thus turns it white. Where through using clash and discord I an able to capture the colors in reflected light for you to see even though you may think it looks white, because that is what the camera has taught you to expect. Lewis Waterfall: I saw it and thought of “the unfailing love” of God for all and we are called to “let justice roll down like water, righteousness like an ever-flowing stream” “to show mercy, and walk humbly with God” In time of hate andviolence we need to see, hear and be touched by this message. Hiking in Ice House Canyon northeast of Baldy Village CA I was looking for a scene that spoke to me. As a Symbolic Realist I am always looking for meaning in nature. As I walked along this cascade looking at the pines, sycamores and granite a Western Columbine perched on top of a bolder caught my eye, so small and seemingly insignificant. This is of Arroyo Pescadero, which I saw on my second hike led by a docent from the Puente Hills Habitat Authority that manages the Puente Hills Wilderness. 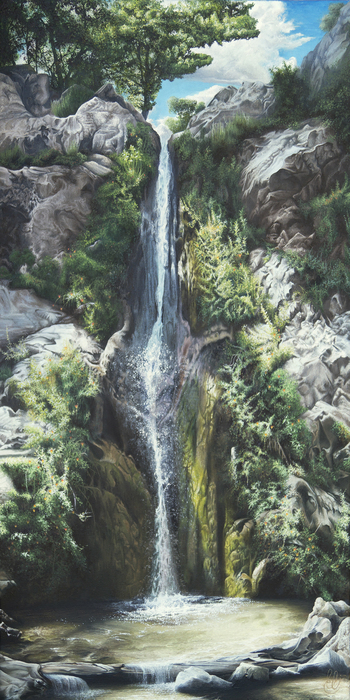 My wife encouraged me to get back into hiking after I retired from teaching art, and standing there over looking this canyon I caught the bug of Wanderlust and have become a serious hiker. 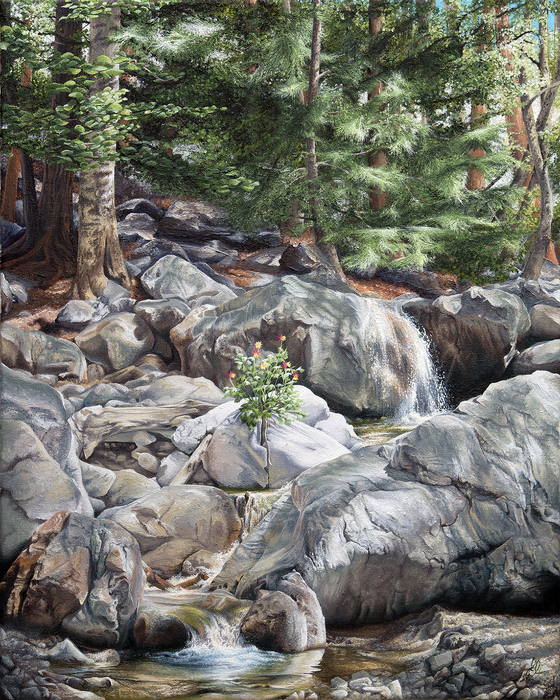 I went back to paint this scene because I felt the presence of God as I wandered through this wilderness. I hiked with a friend up to Etiwanda Falls in the North Etiwanda Preserve near Rancho Cucamonga California to see the falls and was disappointed when I realized the trail led to the top of the falls and there was not a trail to the base. But then as I stood there I heard a sound and turned around to behold the scene I created here. 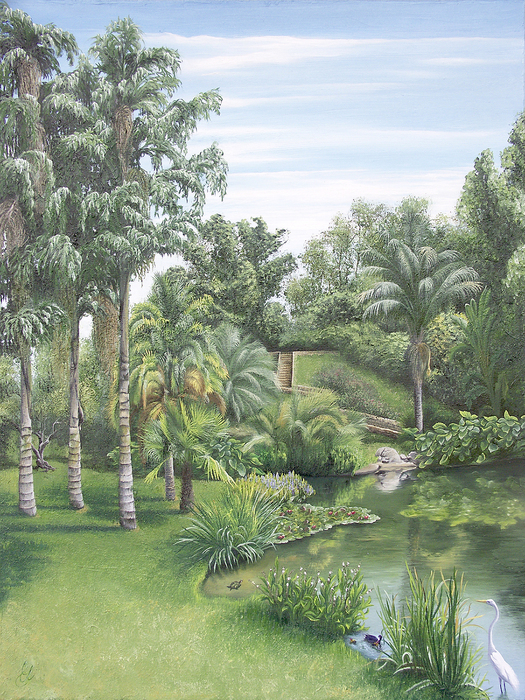 This is the lower pond at the arboretum at California State University, Fullerton. I created this while recovering from shoulder surgery. I had injured my shoulder by doing more than what is expected of a teacher and was afraid I had sacrificed my artistic career and wasted the gift God had given me. Thanks to the surgery the numbness was gone. But my hand shook with tremors & I could not hold the brush still when I started to paint, but overcame it. When I begin a landscape, I never go in with a preconceived idea but must wander until a particular scene speaks to me. I have been to this cliff area at Heisler Park in Laguna Beach, California many times as it is a source of invigoration for me. As I stood at the edge of the cliff this view called to me but I knew not why. As I was finishing it up the title came to me; Faith, Hope & Love from 1st Corinthian13:13. This was done in Powder Canyon, California. The rains had ended & I felt driven to go up into the hills. 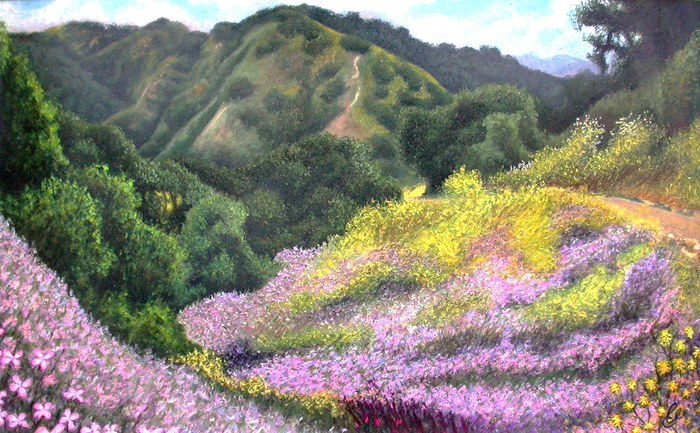 As I came up the steep & winding path with the weight of my French easel on my back I saw the flowers buzzing with bees. I heard the leaves of the trees clapping in the wind & the birds singing their mating songs. My heart leaped for joy as the Quaker song "How Can I Keep from Singing?" burst forth in my mind. This is Tres Hermanos Ranch in Chino Hills, looking north of Grand Ave. towards themountains. At first, Pilgrim may seem an unusual title for this painting. 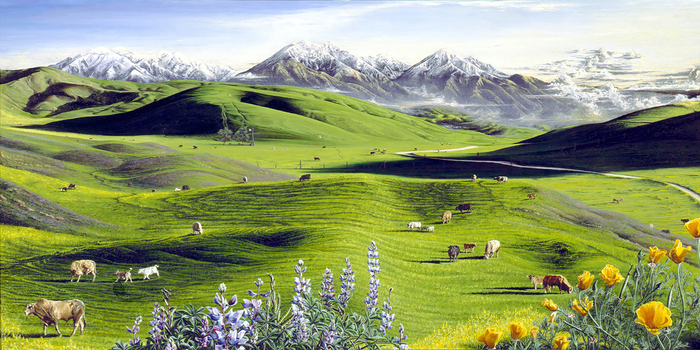 For it appears to be a beautiful meadow, a place where one could escape from the strain of life. Yet, your eyes are drawn from the pasture to the foot of the mountains at the right. There may even be a storm or two up ahead. So it is with our journey. The Bible for this picture is Hebrews 11:1, 8-10. 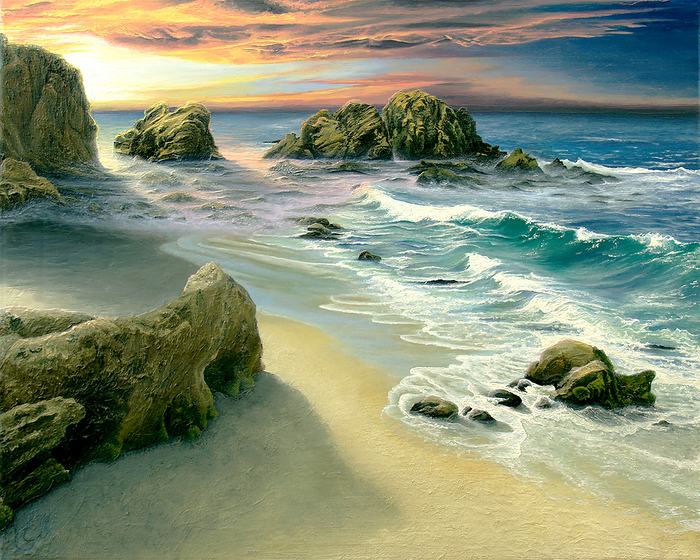 This seascape is of a sunset at Corona Del Mar. At first this is a simple sunset on the ocean, but as you watch you begin to feel as if you are being pulled toward the sun. The radiating design with the center being the sun causes this. Everything in this picture is structured along the implied lines of the radii. The Bible text that I have selected for this picture is Isaiah 43:13a. This is along the crest of the Angeles National Forest in California. 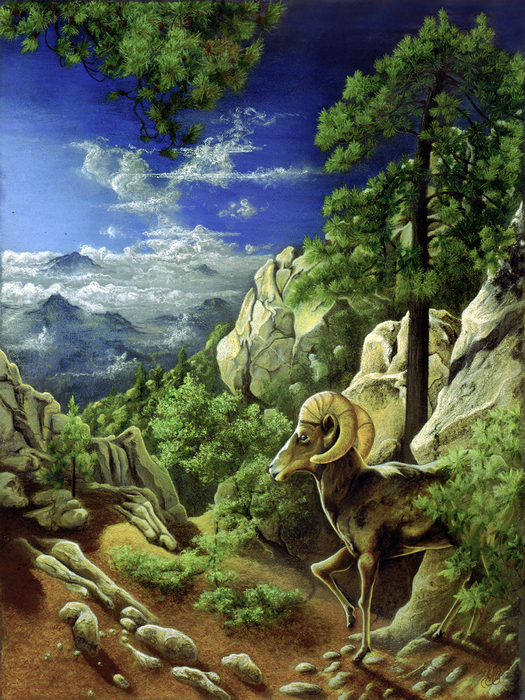 As sun rises sunrise in May a ram has just walked out of the thicket in front of you...On your way to renewal, God may put barriers in your path. They are there because God loves you and wants the best for you. You may have to go down before you can go up in life, but God goes before you as the sun that lights your path and as the ram will watch over you.The Bible text Isaiah 52:12. I love rocky shores. 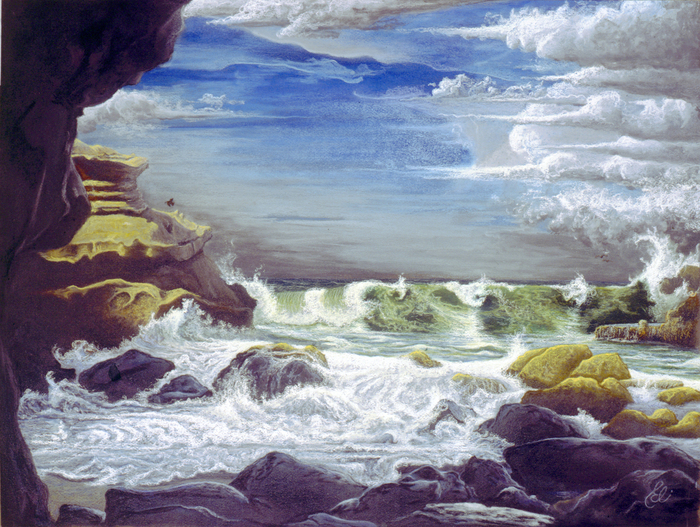 Gentle waves do not interest me but the thundering tide energizes me as it breaks against the rocks. This is at the bottom of the cliffs of Heisler Park in Laguna Beach California. I often come here to be rejuvenated, for I sense the eternity of God here. 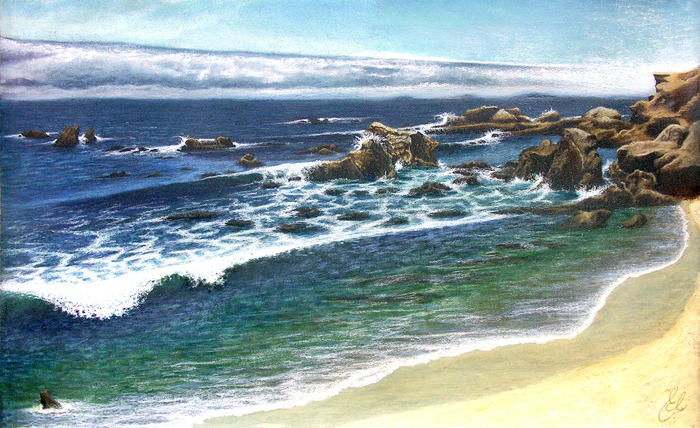 On the day I began this pastel the words from Psalm 93:4 came to me, “mightier than the breakers of the sea - the Lord on high is mighty”. This is of La Jolla Cove from the seaward side of a small cave at low tide. A storm is coming. The tide is rising. 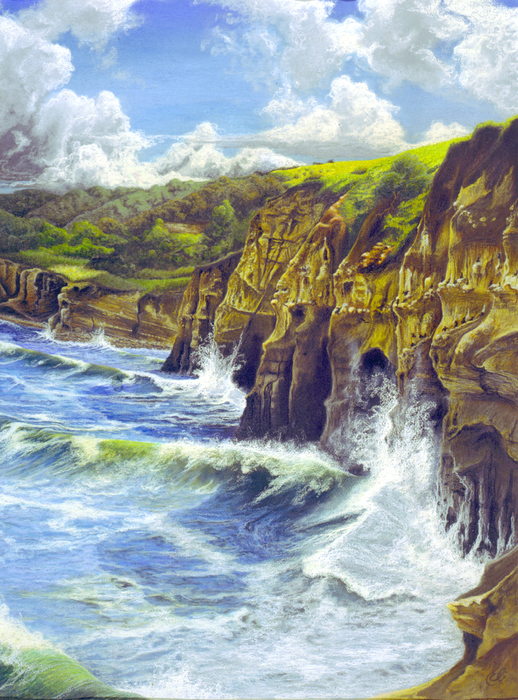 You stand in the shelter of the cave as a green wave crashes upon the rocks. Storms will come into our lives, waves will threaten to sweep over us but there is no need to fear. God will see us through them into the future. The Bible text which I have selected for this picture is Isaiah 25:4. This is the cliff north of La Jolla Cove. The waves move relentlessly forward, drawing your eye with them as they crash against the rock wall or enter into the portals of the caves. Sometimes we meet barriers in our lives that are like insurmountable walls. We could drown, or we can look for an opening, a way around, there may be times when we get lost, like in the caves. But if we keep on trying, God will lead us home. The Bible text is Psalm 84:13. 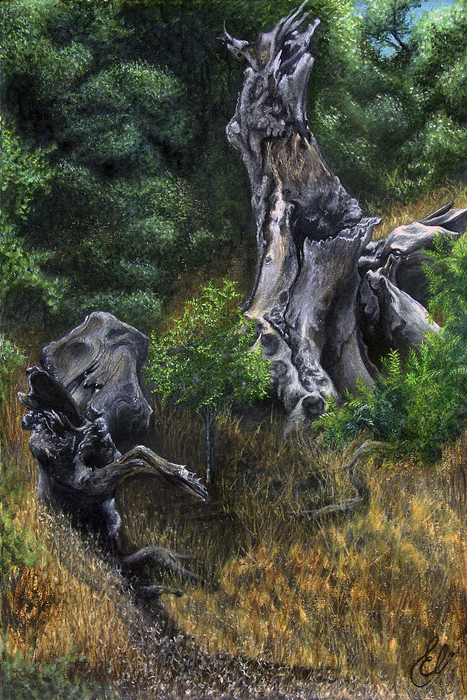 Still Symbolic Realism as with my nature scenes but involving the human figure. 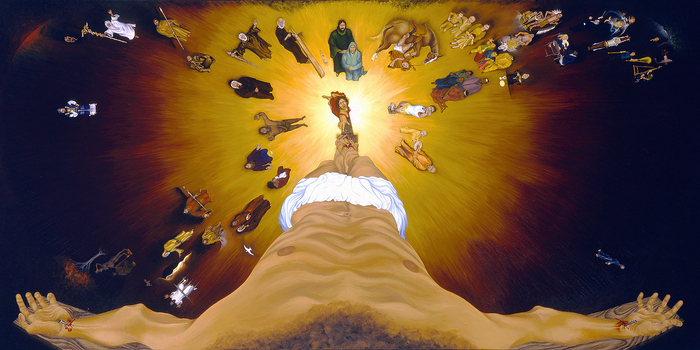 This is the Crucifixion as seen through the eyes of Jesus. In a sense the painting began in began in 1968 with a vision. At the time I did not feel able to carry it out but in 1995 I began a seven-year endeavor. This is not a historical painting but a painting of a vision I believe Jesus had just before he uttered the words, “It is finished.” in John 19:30 and is why he could forgive everyone and give up his spirit. For years I taught my students to interpret art & communicate their feelings through the psychological use of color, line, shape & page placement. It was my practice to have my students interpret my paintings as learning experience for all of us. 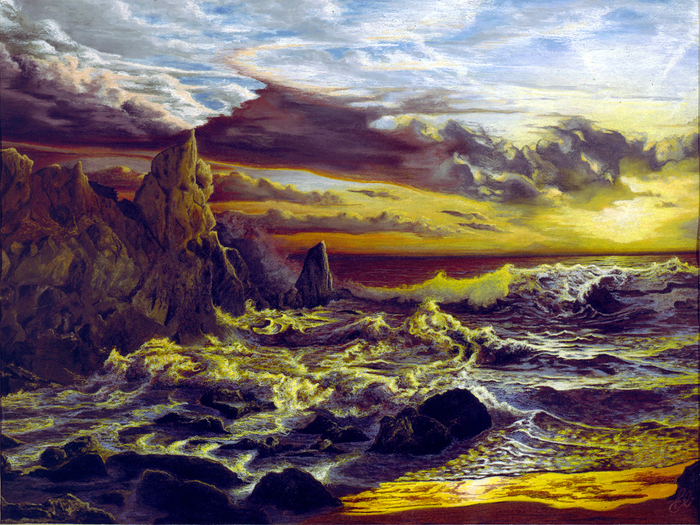 At one of these my students brought to my attention that in each of my paintings was an area of foreboding darkness. They challenged me to explore this darkness in a psychological self-portrait. This is the result. 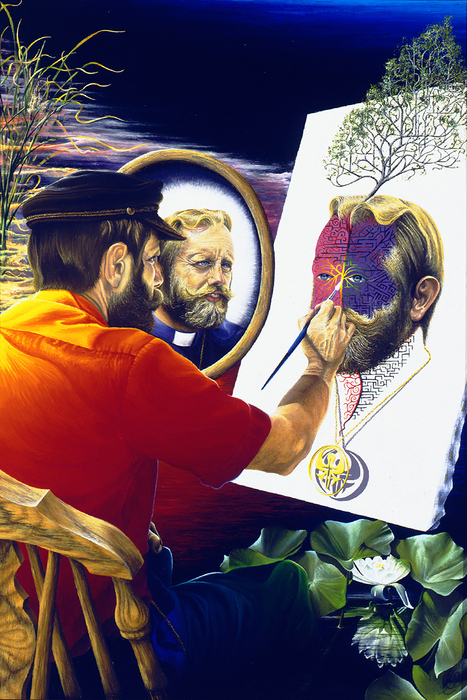 Still Symbolic Realism as in my nature scenes but focusing on the personality and life of the individual as shown in how the head is positioned and in the facial expression. In this self-portrait I sought to portray that moment when I feel a connection with God, inspiring me to create. Some people when they have seen this that it looks like I am ready to cry, others say I am laughing. For me this connection is experienced sometimes with tears, other times with joy and on those rare moments both. 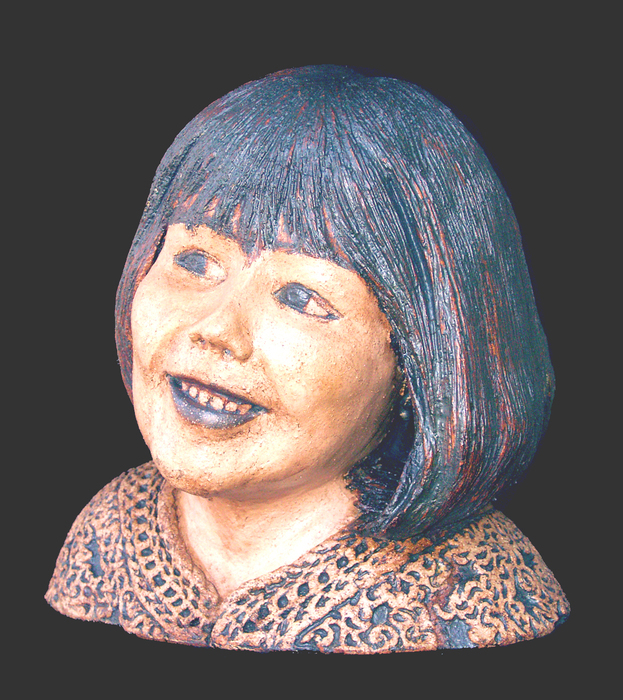 This is a portrait of my granddaughter Clara Luz Ortega at the age of five. I was trying to capture the spirit of her as a child. I joke with people that I grew up and decided I did not like being an adult so I became a child again. When I am creating I am seeing again as if I were a child and I try to capture this playfulness in my work. This portrait is of my grandson Seth at the age of three. For Christmas he got his a toy train engineers cap and scarf. Seth squeals with joy barely able to contain him self with the gift of an “old” wind up wooden train that belonged to his uncle Peter when he was a boy. If it were not for her faith I would be drooling in an institution. At the 41/2 I was bit by a Tsetse fly contracting Encephalitis Lethargic. My fever rose to 108 & I was in a coma for 6 weeks. The doctors said I would be severely retarded. My mother refused to accept this diagnosis & prayed for my full recovery. When I came home from the hospital she became my therapist and tutor and ended up getting a BFA, MA, MFA & M.Div. 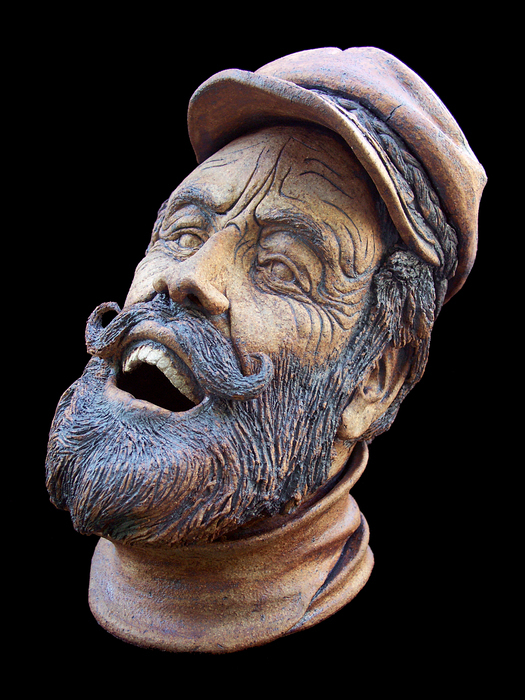 A true orator is one who through the power of speech can bring hope and from which will come the courage to do what the “Nay-Sayers”, say is impossible. Proverbs 28:19: “For lack of a vision the people perish”. I see our President as an ordinary human being with all the foibles, but like the prophets of old, one who has been given a magnificent calling to bless the people with a vision they can base their lives upon. 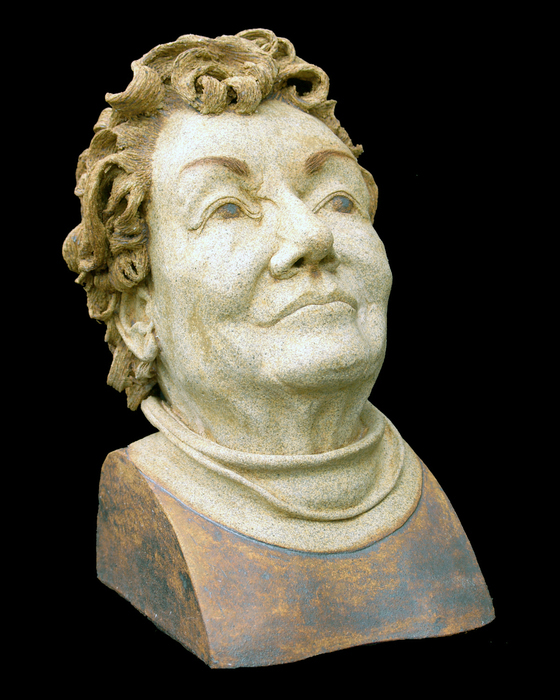 A commissioned portrait of Barbara Collins. What I saw in her was the inquisitiveness of one who has figured out she can change the outcome by how she acts.